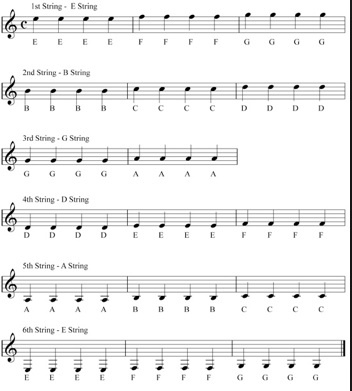 Here are the locations of the notes in the first position. The first thing to do is memorize where these notes are. All you have are 7 notes, but each one exists in more than one place. Because of this, there are 18 note locations (count all the circled letters, including the open strings). Quiz yourself.. The quiz question has the same form every time. Where is the (letter name) on the (letter name) string. For example, where is the F on the D string? Or where is the A on the G string? You don’t need to do this for very long until you know where all the notes are. The next part takes a bit longer, but it’s made easier by the step you’ve just taken by quizzing yourself. Below are all of the notes on the staff in first position. Think of these notes as pictures. Relating note names to the pictures is a recognition of location. Where is the C on the second string? On the second space from the top. You may have noticed that there are 3 Fs in the diagram. Looking at the F on the 4th string will make you think of all 3 Fs for a split second. This will make you stumble mentally. This is normal. It will go away soon. After all, the picture/location for each F is completely different, and your brain will recognize that. This isn’t as hard as it seems. But if you don’t have a good reason to do it, you’ll want to stop. You’ll tell yourself that tab will let you learn what you want without this tedium. Motivate yourself by finding a song melody or a simple solo that you’ve heard. Make sure that it’s in a book without tab. Don’t worry about the rhythm for now. Just figure out where the notes are. Since you already know the song, the rhythm will be in your ear. This gives you a decent start. Keep working on this. Once you feel confident with what we’ve looked at so far, start looking at notes past first position. My favourite book on note-reading is Music Reading for Guitar: The Complete Method by David Oakes.